My freezer is full of this and that. Two small baked sweet potatoes. Half an onion – I was leaving town for ten days and didn’t want it to ruin in the refrigerator. One slice of meatloaf. A half-cup of spaghetti sauce. A plastic container labeled ‘For Soup’ stores a spoonful of corn, a few servings of green beans and lima beans, celery leaves, and who knows what else – all leftovers to go into a pot of vegetable soup. I don’t like to throw away food. When I peel apples and pears for my Grands, I usually eat the peeling. I’ve even boiled citrus peelings with cinnamon to make good use of the peelings and make the house smell good. I dice the thick stems of broccoli for salads. I chew on the tough core of pineapples. And I know about composting, but don’t do it. I should because then I’d never waste food. Potato peelings, apple cores, pineapple leaves, eggshells – all could go into compost. A Reader’s Digest article about fresh produce entitled “Food Parts You Should Never Throw Out” caught my eye. According to the article, most of us throw away nutrients when we dispose of what we consider waste. Pineapple cores were listed first and I patted myself on the back. But I didn’t think of adding chunks of core to a cup of hot tea or chopping it finely to add to chutneys or a stir-fry. I was reminded of the many possibilities of citrus zest: blend in smoothies, vinaigrettes and marinades or stir into yogurt, cottage cheese, and oatmeal. Citrus peel provides fiber and three times as much vitamin C as the flesh. I’ve never tried eating kiwi skin; even thinking of its fuzzy texture makes my mouth dry. But I’ll try biting into the whole fruit because kiwi’s vitamin C level decreases when the fruit is peeled and exposed to oxygen. Watermelon rind provides an amino acid that is good for heart health. I know about pickled rind, and this summer I’ll add chopped rind to fruit salads and slaw. Who knew watermelon seeds can be roasted? I roast pumpkin seeds, but have never roasted watermelon seeds. I was nodding in agreement until I read the words ‘Banana Peel.’ You might remember my column about bananas. I can’t eat a banana. Its mushy, slimy texture gags me. I almost skipped this section, but I read on out of curiosity. Banana peels provide amino acids, which boosts serotonin, known as the happiness hormone. The best peels are ripe ones because they are softer, thinner, and tastier, according the article author, Isadora Baum. To soften the peels, boil them for at least ten minutes (imagine that stench) and then add them to soups or smoothies. Or puree the peels and add to muffin or cake batter. And the kicker: for a real treat, slice and bake a banana with the skin on. 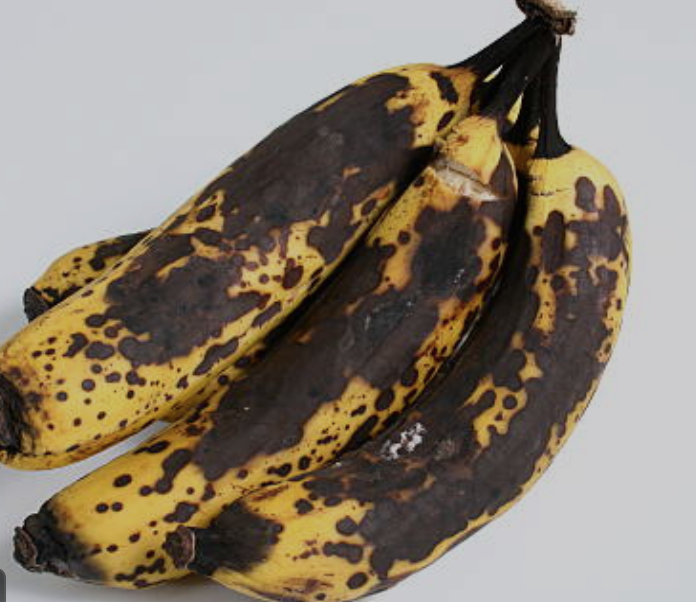 I won’t eat a banana peel in soup or a muffin or baked. Not even for its happiness hormone. Some things should be thrown out.